I’m skeptical about … pediatric fever. Body temperature varies throughout the day, lowest in the morning and higher in the afternoon, ranging from 97 to 99F. Fever is defined as a rectal temperature greater than 100.4F (38C). Fever is not a disease. Fever does not kill children. Treating fever does not shorten the duration of an infectious disease. Treating fever does not reduce the recurrence of fever-related seizures. Despite the fact that more than 80% of pediatricians advise parents not to wake a sleeping child to administer fever-reducing medicines, more than 80% of parents admit to doing just that. In survey after survey dating back to the 1980s, the majority of caregivers rate their concern over pediatric fever as “high” or “very high.” There’s a lot of fear out there. In 1980, pediatrician Barton Schmitt coined the term “fever phobia” to describe this phenomenon, characteristics of which include: fear that fever may result in “brain damage” or death; administration of fever-reducing medicines for temperatures less than 100.4 (i.e. when the child doesn’t actually have a fever); waking sleeping children solely to administer fever-reducing medicines; consulting a doctor for fever of less than a day’s duration in an otherwise well-appearing child; obsessively measuring a child’s temperature; administration of fever-reducing medicines more frequently than recommended or administration without checking the temperature. Along the way, I suspect the majority of parents reading this have been guilty of at least one of these things and that’s okay. I have, too. The purpose of this post is to increase your comfort level in managing your child’s fever. Although fever may appear to be a random, chaotic event, it is actually a well-orchestrated reaction to infection indicating a healthy immune system. The body’s thermostat resides in the hypothalamus, an almond-sized organ at the base of the brain. Its primary function lies is relaying hormonal signals to the pituitary gland (the endocrine system’s Grand Central Station). It serves other functions as well, but the one pertinent to our discussion is thermoregulation. In response to infection, white blood cells release pyrogens (literally meaning “to start a fire”), that subsequently signal the hypothalamus to turn up the body’s thermoregulatory set point. It’s similar to turning up the thermostat in your house. The furnace kicks on and the place warms up. Let’s say your 4-year old daughter has a normal temperature of 98F, but brings home a bug from preschool. Her immune system is healthy. Her white blood cells get busy and begin churning out pyrogens that, in turn, reset her hypothalamus to 103F. Her body is now 5 degrees colder than the new set point. She tells you she’s “freezing” despite the fact that her forehead is “burning up.” To warm her, you pile on some blankets, and she begins to shiver, generating additional heat driving her temperature higher until it reaches 103F. The body is all about balance, and just as there are pyrogens to raise body temperature there are cryogens to cool it down again. This is why a fever doesn’t remain elevated for long, even if fever-reducing medicines like acetaminophen (Tylenol) and ibuprofen (Motrin, Advil) aren’t taken. But being a good parent and sensing your daughter’s growing misery, you administer a weight-based dose of Tylenol, which works over 20 to 30 minutes to restore her hypothalamic set point back to 98F. Now your daughter’s temperature is 5 degrees too hot! She kicks off the blankets and begins to sweat, dissipating heat, until she arrives back where she started. Before she gets well, this process will likely repeat itself multiple times. And it’s all entirely normal. One way to help limit fever is to avoid over bundling which only serves to drive a fever higher. This is also why cold water baths are not recommended—if the water is cold enough to cause shivering, it’s too cold. Shivering elevates temperature. And here is where the word “tepid” always finds its way into the conversation. Sponge baths, if done at all, should be performed with lukewarm water, slightly higher than room temperature. Although alcohol applied to the skin does work to facilitate evaporative heat loss, the small amount of alcohol absorbed can be toxic to an infant. Ice water and alcohol baths are out. So is aspirin to reduce fever in children due to its occasional association with Reye’s Syndrome, a potentially fatal reaction characterized by swelling of the liver and brain. There’s also no truth to the ancient maxim “feed a cold, starve a fever.” Go ahead and eat. When you’re sick you need extra nutrients—not fewer. Eating during an infection does not result in either more frequent fevers or higher fevers. And now we get to the heart of the matter: Is fever harmful? The short answer is “no.” In response to infection, it is virtually impossible to reach temperatures greater than 107F, the temperature at which neuronal damage occurs. In a study of more than 130,000 pediatric ER patients presenting with fever, fewer than 1 in 1,200 had a temperature of 106F or greater. And while it is true that children with serious infections like pneumonias, kidney infections, or spinal fluid infections (meningitis) tend to have high fevers, the converse isn’t true; the vast majority of kids with high fevers do not have serious infections. Remember: 90 to 95% of pediatric fevers are caused by self-limited viral infections. So, if fever isn’t harmful, is it helpful? The answer here is “yes,” which is why our bodies evolved a fever response in the first place. Fever inhibits viral and bacterial replication, promotes white blood cell phagocytosis of pathogens, and activates T-lymphocytes. There is even data showing that fever enhances penicillin’s antibacterial effects in the body. More than 2000 years ago, Hippocrates said, “Give me the power to create a fever and I shall cure any disease.” He might have been engaging in a bit of hyperbole, but you get the idea. Fever isn’t harmful. There’s another reason why we should be thankful that children develop a fever. It serves as a warning; “Hey, take a look at me. I might be sick!” Particularly in infants, fever is often the first—and sometimes only—sign that something is amiss. Without that fever response, parents and physicians wouldn’t be so quick to examines children with potentially serious infectious diseases. So, if fever isn’t harmful and is, in fact, protective, then why all the fear? That’s easy; just ask any parent who has seen his/her toddler melt into a plate of warmed-over-death from a high spiking fever. Children with a fever to 103F look awful and feel awful. Sure, it’s helpful to intellectualize the process, but when it’s your child lying there, limp as a daisy, the concern soon turns to one of, “This looks bad. My child might be pushing up daisies if this doesn’t stop!” This seemingly primordial fear is not unfounded—before the age of vaccination and antibiotics, 165 of every 1,000 babies born died before their first birthday, almost all from infectious diseases. Despite the plummeting of this number to fewer than 6 per 1,000 today, many parents still equate fever to the possible death of their child. Fever from infection does not cause death, but it can cause a seizure. Watching your child lose consciousness, turn blue, and seize is a terrifying thing for a parent to watch, but it almost never leads to long-term harm. Febrile (fever) seizures are common, occurring in 1 in 30 children. That number swells to 1 in 5 if there is a sibling with a history of fever seizures. They are most common in toddlers between the ages of 12- to 18-months, and are rare before age 3-months or after age 6-years. The good news is that the majority of kids with a fever seizure will never have another one, while a third will have just a single additional seizure before “growing out” of them. Now here’s the strange thing: administering anti-fever medicines around the clock doesn’t prevent additional seizures. Although on the surface, this doesn’t make sense, it’s been verified in a number of studies. The reason to treat fever is not to prevent seizures, brain damage, or death; it’s too provide comfort! This is the only legitimate reason to give your child a fever-reducing medicine. Overall, if our bodies functioned more efficiently at 102F, we’d always be 102F! Tylenol and ibuprofen both work well to reduce fever. If one doesn’t seem to be working then it’s okay to administer the other, but there is no need to give both simultaneously. In a meta-analysis comparing the two, ibuprofen (Advil, Motrin) was found to be marginally more effective and lasted longer per dose than acetaminophen (Tylenol). They were equally safe. In my experience, there is also less of a “yuck” factor with ibuprofen. Note that both are widely available as generics, but that many of them taste awful. It’s a good idea to try a sip yourself—if it tastes bad to you, it’s a certainty that your child won’t drink it. It’s not worth saving a dollar if the result of that savings ends up on your shirt. Certainly, I would be remiss if I didn’t mention that the very best way to limit fever illnesses is to vaccinate your children. No excuses—vaccinate, vaccinate, vaccinate! When I started practicing back in the early 1990s, it was common practice to send a blood count and culture on all infants with a fever greater than 102.5F, and empirically treat those with high white blood cell counts knowing that 3-10% of them would ultimately have bacteria growing in their bloodstream, mostly from Haemophilus influenzae type B (the bacteria, not the flu virus) and Strep pneumoniae. The incidence of the former dropped by 99% after the introduction of the Hib vaccine in 1988, and the latter by 64% with the PCV7 vaccine in 2000 (lower still today with the even more protective PCV13 vaccine). The likelihood of a positive blood culture in a child with a high fever today is less than 1%, rendering the old practice of routine blood cultures and empiric antibiotics obsolete. Nothing is more effective than vaccination. And here’s an example of what happens when people stop vaccinating. In 1974, 80% of Japanese children were receiving the pertussis (whooping cough) vaccine with the result being that there were just 393 reported cases and zero deaths in all of Japan. Five years later, however, after the vaccination rate had dropped to 10%, the results were dramatic, with more than 13,000 cases of pertussis and 41 deaths. In just 5 years, the number of kids with whooping cough increased 33-fold! You can bet the Japanese vaccinate their kids against whooping cough today. Remember, too, that due to a phenomenon known as “herd immunity,” failing to vaccinate your children not only places them at risk, but places all children at risk. For children under the age of 90-days, the measurement of temperature is more critical and the only reliable way to check it is to use a rectal thermometer. Axillary (armpit), tympanic, and forehead thermometers are unreliable, and increasingly so at the high and low ends of the spectrum, off by as much as 2 degrees relative to rectal thermometers for fevers greater than 102F. And you can’t just check the armpit temperature and add a degree—that’s wholly inaccurate. For older kids, where an exact temperature is rarely needed, any type of thermometer will due, but if you’re still relying on your grandmother’s mercury thermometer, do yourself a favor and upgrade to one with a digital readout. Barton Schmitt, “Fever Phobia: Misconceptions of Parents About Fevers,” JAMA Peds 1980; 134 (2): 176-81. Hedra Tesslor et al., “Unrealistic Concerns about Fever in Children: The Influence of Cultural-Ethnic and Sociodemographic Factors,” IMAJ 2008; 10: 346-9. Barbara Trautner et al., “Prospective Evaluation of the Risk of Serious Bacterial Infection in Children Who Present to the Emergency Department with Hyperpyrexia (T of 106F or Higher),” Pediatrics 2006; 118 (1): 34-40. Edward Purssell, “Parental Fever Phobia and Its Evolutionary Correlates,” J Clin Nursing 2008; 18: 210-18. Michael Poirier et al., “Fever Phobia: A Survey of Caregivers of Children Seen in a Pediatric Emergency Department,” Clin Peds 2010; 49 (6): 530-34. Martin Offringa et al., “Febrile Seizures,” BMJ 2015; 351: n4240. David Perrott et al., “Efficiency and Safety of Acetaminophen Versus Ibuprofen for Treating Children’s Pain or Fever: A eta-Analysis,” Arch Ped Adolesc Med 2004; 158:521-6. Ravi Jhaveri et al., “Management of the Non-Toxic Appearing Acutely Febrile Child: A 21st Century Approach,” Pediatrics 2011; 159 (2): 181-5. Janice Sullivan et al., “Clinical Report—Fever and Antipyretic Use in Children,” Pediatrics 2011; 127 (3): 580-7. Molly Jean-Mary, “Limited Accuracy and Reliability of Infrared Axillary and Aural Thermometers in a Pediatric Outpatient Population,” J Peds 2002; 141: 671-6. This entry was posted in Uncategorized and tagged childhood fever, pediatric fever. Bookmark the permalink. ← I’m skeptical about … cough medicines (revisited). How long do you let a fever go before it’s enough? My granddaughter has had a fever for 8+ days- day 2 we were told it’s a virus let it run it’s course, day 5 urinary track check for infection was negative – back to virus! Now at day 8! Fevers are anywhere from 102-104.8! Very frustrating- want to take her back to Dr. again but don’t feel like going for a fear will get told the same thing it’s a virus ! I believe the answer here has to do with the overall appearance of your granddaughter. Is she sick or merely puny when the fever recurs? 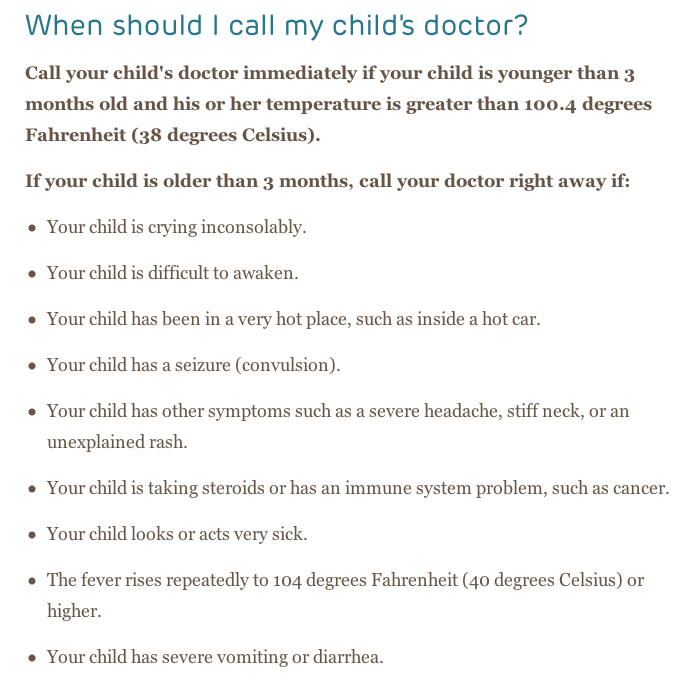 Again, it’s not necessarily the height or duration of the fever as much as whether the child actually appears “sick.” A floppy, inattentive, toxic-appearing child demands a recheck irrespective of fever. Yes it’s frustrating, but hang in there and don’t be afraid of taking your granddaughter if her appearance is worrying you. And yes, 8 days is a long time for a child to maintain a fever but not uncommon with certain illnesses like influenza and mono.